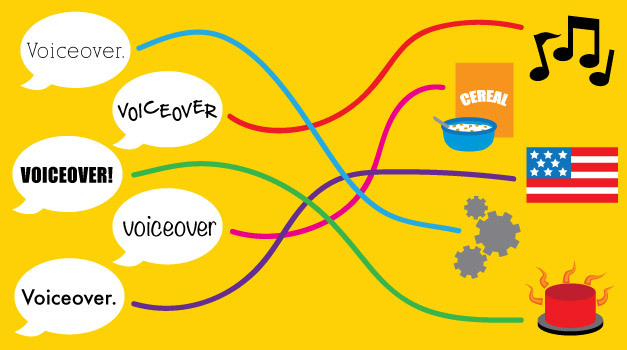 From the silent voice of your conscience to the familiar, booming voice of Morgan Freeman, we can quickly identify vocal characteristics and associate them with specific moods and feelings. Today, we’re going to test your pairing knowledge with a fun match game that allows you to pair video imagery with various voiceovers; you’ll make matches based solely on voice characteristics and personality traits. 1C — High-end companies don’t always have the highest quality products, but they need and want consumers to think they do. Because elevated vocabularies imply higher intelligence, much like a calm confidence implies sophistication, these characteristics seem like a good match for high-end companies. 3B — Highly technical product information usually takes longer to digest. Therefore, pauses for emphasis can help clarify points by giving the listener additional time to understand the commentary. 4A — Music festival goers can range from teens crushing on pop stars to middle-aged metalheads. But the one thing they all have in common is a passion for the music they are going to experience, not just hear. A young, spunky voice can be relatable to younger audiences, but also nostalgic for older crowds. 5D — There are many ways to approach global warming and gun control, but one of the most compelling voices can come from the person that will be experiencing the outcomes of our decisions for years to come. The intention here would be that school-aged children rarely understand every facet of hot-button issues where they depend on adult decisions to shape their futures. 6F — Who better to represent a new product for a well-known company than its number-one user? Kids and cereal have gone together like Mikey and LIFE for decades. It’s a perfect match, and the perfect way to engage with both parents and kids. 8E — In 2018, the voices of WWII heroes are rarely clear. They are older in age and have experienced a lot. No matter how strong and wise the voice, it will likely be interrupted by emotion or health side effects. Voices such as these evoke respect and honor, compelling audiences to listen closely. Of course, there are many ways to pair videos and voiceovers, but what’s important at the end of the day is matching voice characteristics to your brand’s personality. A technique we use is closing our eyes when listening to voiceover samples and jotting down what vibes we get while listening. We then evaluate if we wrote down words that match the tone of the brand. If they do, then we’ll proceed. If not, we’ll keep searching. To complete videos, we apply the same rule of thumb to background music. At the end of the project, you’ll have a cohesive video that truly represents your brand, as well as looks and sounds great!